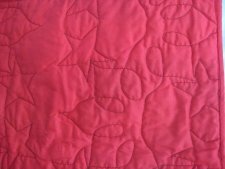 I've just finished 4 baby quilts that are intended for a local charity. These quilts serve a dual purpose .. and in this case .. triple duty. Since I've returned to using my Tin Lizzie to quilt, I've needed something *to* quilt. I've been reluctant to use my "good" tops for practice, not only cuz I have an emotional investment in these tops (for whatever reason) and don't want to make "practice" mistakes on them but also their size is overly large for practice. 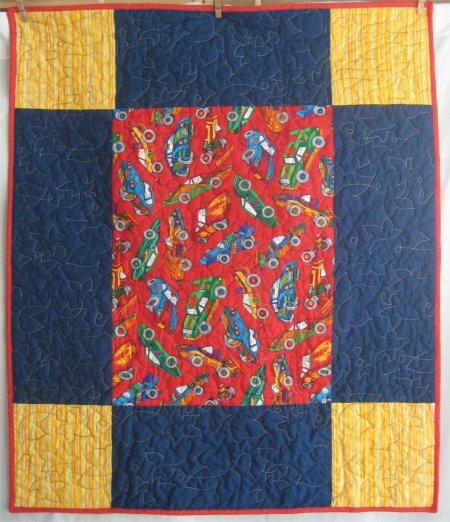 Baby sized quilts are a perfect solution. 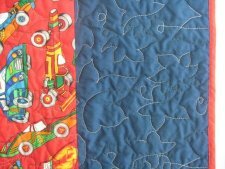 On my local Freecycle, I scored a messload of quilting fabrics. 99.9% were motifs that I had no personal interest in but were still good, quality fabric. 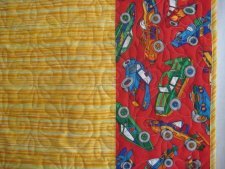 Baby sized quilts using these (literally) free fabrics is the perfect use for them. 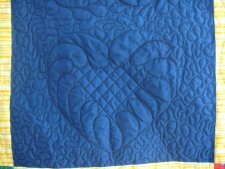 I've been thinking for some time now about "doing a good deed" and making charity quilts gives me a good feeling about using my skill for someone in need. I can do this on my schedule without the pressure of doing something on a regular basis ... when I have some to give, I will. 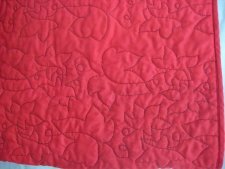 For 3 of these quilts, I used Anita Grossman Solomon's "Super-Sized Nine Patch" (SSNP) quilt directions. I gotta admit, her idea for mass producing these quilts is sheer genius. (Anita .. you are Da Bomb!) She calls for 3 different fabrics, 1 yard each, to produce 3 baby quilt tops, all different yet coordinated. I used 1-1/4 yards for each backing, with 1/4 yard of that to make continuous bias for the binding (Anita calls for the birthing technique to finish the quilts but I don't care for that myself.) This technique is absolutely slicker than cow slobber! 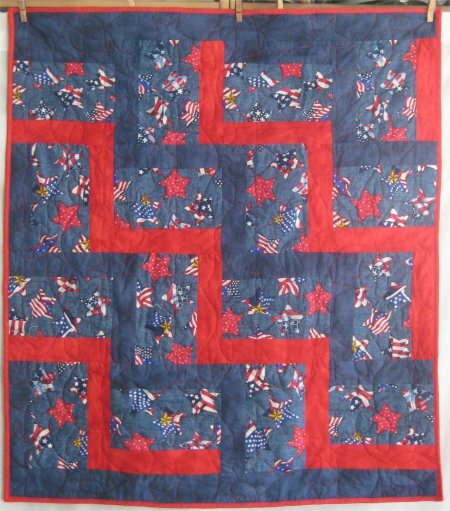 :-) I've mentally identified the SSNP quilts by the color of the center panel. The first SSNP is the Yellow Center. 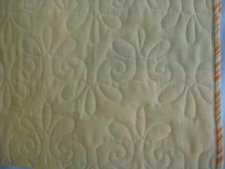 I used the "Chantilly Lace" pantograph by Cranberry Quiltworks and did edge to edge quilting with ecru tone-on-tone variegated King Tut thread. I chose this pantograph because it was all loops, hence *should be* simple. The first row was a little shakey but by the end of the quilt, I was quite pleased with it. You'll get a better sense of the quilting from the back. The second SSNP is the Red Center. 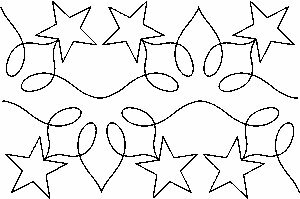 I used another pantograph that has no name but looks like interlocked maple or ivy leaves ("From the Garden" set, panto DH1562, but no "name" and no designer). The edge-to-edge quilting was done with multi-colored gray-black-beige King Tut thread. This panto was a little more challenging than Chantilly Lace because there are many points on the leaves and there are 2 sizes of leaves. I learned that I need to "pause" ever so slightly at each point so that I don't get undue stress loops on the backing and the points of the leaves remain sharp. You'll get a better sense of the quilting from the back. I am pleased with the results of this effort. The third SSNP is the Blue Center. This is the most ambitious of the three, as I decided I wanted to do some free motion work instead of a pantograph. 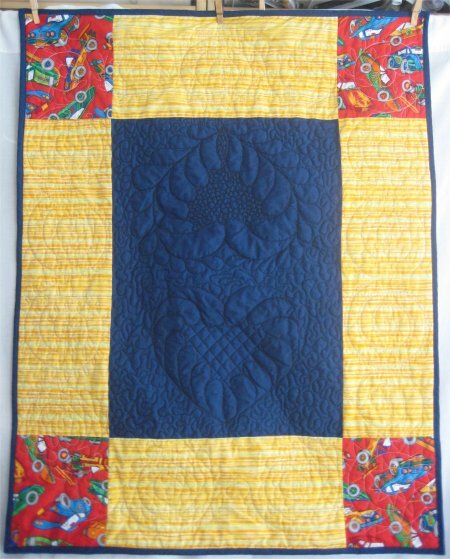 Since the center panel was a solid color, I could do something where the quilting itself was the featured element. I chose to do two hearts. One heart has feathers on the inside & out and I chose to practice "pebbles" in the interior. I was pleasantly surprised at how forgiving and easy these free motion pebbles are to do, albeit somewhat time-consuming since the pebbles are small. As you are making the pebbles, it really doesn't matter how many times you circle around the perimeter, while you decide where it is you want to make your exit! The other heart has feathers on the inside only and has cross-hatching on the interior. I must confess that the reason there are no feathers on the outside of the heart is because .... I forgot to do them. :-) I also need to figure out how to do cross-hatching properly, as this effort isn't that terrific. Meandering goes around the exterior of both hearts, but stayed inside the blue center. The thread is black King Tut. 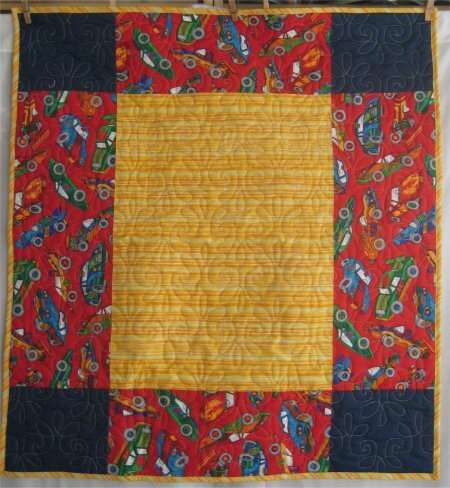 For the borders of this quilt, I used a template I bought at PIQF (Pacific International Quilt Festival) in Santa Clara last month. 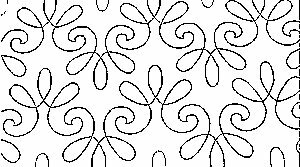 The templates are Natilus Spirals by Quilter's Rule and are used to produce a wonderful spiral baseline, which you can then embellish or not. In this sample, I have outlined the baseline in black and the "leaf" embellishments in green. 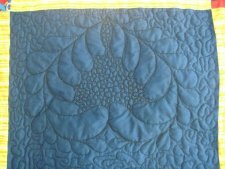 I purposely didn't embellish every spiral the same, as part of the purpose of these quilts is for me to *practice* different designs and techniques. The embellishment I used were leaf shapes, curved "hooks", loops, feathers and spikes. I'm still figuring out how to use which sized spirals in combination with other sized spirals to fit the border space ... what I did on this quilt isn't sized quite perfectly. :-) The thread is the same ecru tone-on-tone King Tut as used in the Yellow Center. The lone non-SSNP quilt is a Rail Fence. 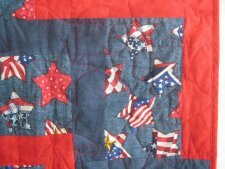 I returned to the loops and stars pantograph that had given me SOOOOO much trouble on the Schizoprenic Buzz Saw quilt. I was annoyed that the first effort turned out so badly and I *WAS NOT* going to let a stinking pantograph tell me I couldn't do it! Since I had a couple of other edge to edge pantos under my belt, I was more confident about this particular design .. and indeed, it came out mostly decently. The beginning effort was a tad shakey but by the end of the quilt, it was more than adequate. The thread is a red variegated King Tut. You'll get a better sense of the quilting from the back.